A collection of problems and solutions in real analysis based on the major textbook, Principles of Real Analysis (also by Aliprantis and Burkinshaw), Problems in Real Analysis is the ideal companion for senior science and engineering undergraduates and first-year graduate courses in real analysis. It is intended for use as an independent source, and is an invaluable tool for students who wish to develop a deep understanding and proficiency in the use of integration methods. 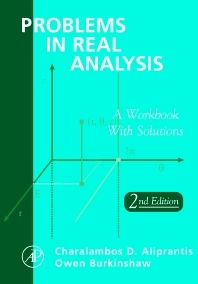 Problems in Real Analysis teaches the basic methods of proof and problem-solving by presenting the complete solutions to over 600 problems that appear in Principles of Real Analysis, Third Edition. The problems are distributed in forty sections, and cover the entire spectrum of difficulty. Indiana University-Purdue University, Indianapolis , U.S.A.